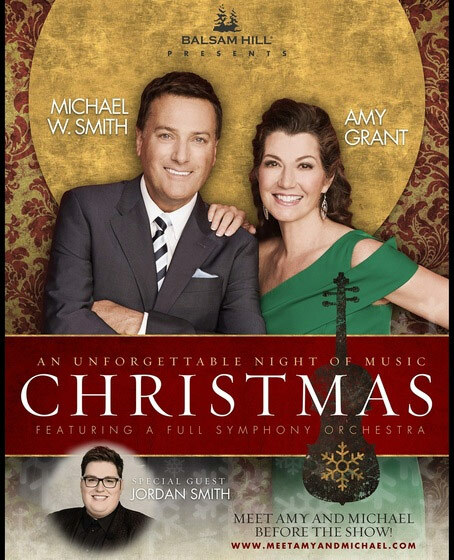 NASHVILLE, Tenn. – Nov. 9, 2017 – This weekend, multi-platinum, GRAMMY® winners Amy Grant and Michael W. Smith will kick off their popular Christmas tour Nov. 11, joined for the second consecutive year by Republic recording artist Jordan Smith, Season 9 winner of NBC’s “The Voice.” Featuring a full symphony orchestra at each performance, this seasonal celebration has a history of sold-out performances across the country, making it nothing less than a holiday tradition. And nothing says “tradition” more than Christmas trees at Christmastime, which is why both Amy and Michael are thrilled to have Balsam Hill® on board as the title sponsor for this year’s Christmas dates. As the industry leader in lifelike artificial Christmas trees, ornaments and other Christmas décor, Balsam Hill will play a prominent role on the Amy Grant and Michael W. Smith Christmas Tour. Concert attendees will see some of Balsam Hill’s beautiful, lifelike trees adorning the stage at each of the 22 concert dates throughout November and December. Combining for a vast collection of critically-acclaimed holiday albums between them, the 2017 Christmas tour will showcase selections spanning the artists’ expansive Christmas repertoires, including their most recent releases, Grant’s Tennessee Christmas, Michael W. Smith’s The Spirit of Christmas and Jordan Smith’s ’Tis The Season. Amy Grant's career spans more than 30 years and stretches from her roots in gospel into becoming an iconic pop star, songwriter, television personality and philanthropist. With three multi-platinum albums, six platinum albums and four gold albums, her total career album sales have exceeded 30 million. Grant’s chart success has been consistent throughout her career with six No. 1 hits, 10 Top 40 pop singles, 17 Top 40 Adult Contemporary tracks and multiple Contemporary Christian chart-toppers. In addition to her six GRAMMY® Awards, Grant has earned 26 Dove Awards (including four Artist of the Year Awards) and has been awarded a star on the Hollywood Walk of Fame. Conventional wisdom has it that Grant put Contemporary Christian Music on the map becoming the first Contemporary Christian artist to have a platinum record, the first to hit No. 1 on the Pop charts and the first to perform at the GRAMMY® Awards. With that, her legacy as one of the most influential artists of the past four decades is assured. In April 2015, Grant celebrated the 25th anniversary of her iconic hit “Baby Baby” with a worldwide release of the song featuring pop sensation Tori Kelly and released Tennessee Christmas in 2016, marking her first all-new holiday album in nearly 20 years. Jordan Smith’s much anticipated debut album, Something Beautiful [LightWorkers Media/Republic Records], is available now everywhere. Throughout the album, his undeniable delivery and instantly recognizable range drives both original songs and cover tracks produced by legends such as GRAMMY® Award winning producer David Foster [Céline Dion, Michael Bublé, Josh Groban] and modern hit maker Stephan Moccio [The Weeknd, Ellie Goulding, Miley Cyrus]. The 23-year-old from Harlan, KY, Jordan Smith stands out as the highest-selling artist to ever emerge from NBC’s EMMY AWARD®-winning “The Voice.” In less than six months, he sold over 1 million singles and made Voice history by landing eight songs in the iTunes Top 10—the first artist from any season to hit the iTunes Top 10 every single week of the Live Rounds. Of the eight songs that went Top 10 on iTunes, six hit Top 3, and three captured No. 1 on iTunes, all of which knocked Adele off the top spot! His first holiday album, 'Tis The Season, is available now. Founded ten years ago in Redwood City, Calif., Balsam Hill is committed to creating the best Christmas trees on the market. Founder Thomas Harman was inspired to start Balsam Hill by a family member who was allergic to live trees but wanted to create a festive atmosphere in his home during the holidays. When Thomas' search for a lifelike artificial Christmas tree came up empty-handed, our mission was born to develop the most realistic and luxurious artificial trees. To accomplish this mission, our designers carefully craft trees to mimic nature using site visits and cuttings from live trees as a guide. Balsam Hill holds several patented and trademarked technology that brings the holidays to life including ultra-realistic True Needle™ branches, unique Color+Clear™ or Candlelight™ LED lights, and innovative Flip Tree™ technology. Founded in 1952, Compassion International is a Christian child development organization that works to release children from poverty in Jesus’ name. Compassion revolutionized the fight against global poverty by working exclusively with the Church to lift children out of spiritual, economic, social and physical poverty. Compassion partners with more than 7,000 churches in 26 countries to deliver its holistic child development program to over 1.9 million babies, children and young adults. It is the only child sponsorship program to be validated through independent, empirical research. For more information, visit www.compassion.com.